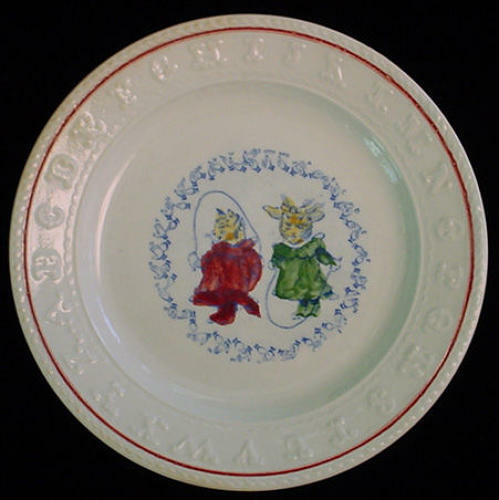 This large 8 1/4 " plate has a crisp image transfer printed in rich dark blue with under glaze painting in green, golden yellow and bright red. The plate feature a rope type border followed by the entire alphabet in the most wonderful typeset. The central image has the alphabet in sign language surrounding two delicious cats jumping rope. Condition is very good. A short tight hairline crack at the letter v. Clean and bright. Pearlware glaze. This transfer in this blue color is rarely seen on the market, will be a special abc plate in your collection.